The Formula of Return on Average Assets can be calculated by dividing Company’s Annual Net Income to its Average Total Assets. In every case, it is not mandatory to have average total assets. In most of the cases return on asset is also used. It is given as below. Generally, return on Average Assets is used by banks and other financial institutions as an appraisal for finding its performance. It is calculated at period ends, like quarters, years etc., the return on average assets does not show all the lows and highs. It is, rather, just an average of the period under consideration. The return on Average assets ratio often called the return on total assets is a profitability ratio that calculates the net income produced by total assets during a given period by comparing the net income to the average total assets of the company. In simple words, the ROA or return on assets ratio calculates how efficiently a firm or management of a company can manage its assets to produce profits during a given period. In short return on Average assets ratio measures how profitable a firm’s assets are. 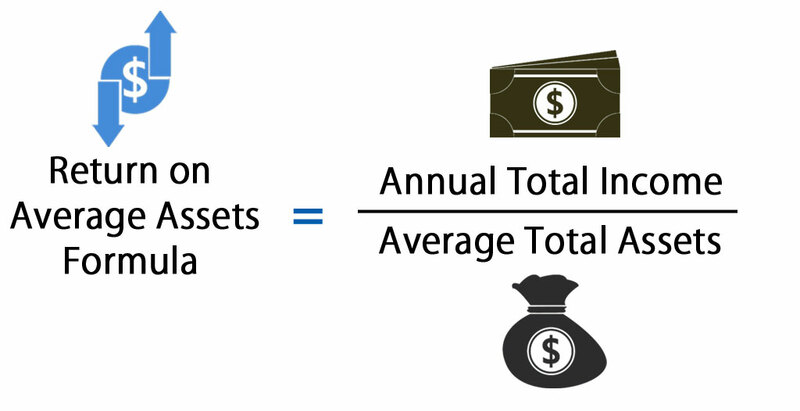 A ratio of Return on Average Assets is displayed as a percentage of total average assets. One of the limitations with the return on average assets is that it assumes the beginning and ending asset figures are actual of the asset levels maintained on a daily basis, which is not necessarily the case. If the Return on Average Assets is lower, it can easily be concluded that the firm is the higher asset-intensive firm. On the other hand, if the Return on Average Assets is higher, the firm is lower asset intensive. Suppose ABC Company earns $ 4,000 as annual net income while average assets are $40,000. This indicates that the ABC Company has $0.1 of net income for every dollar on invested assets. Return on assets should be compared with the peers in the same industry. As a return on assets has stark differences in different industries. So it is wise to compare the return on assets with its peer for a good comparison. Company XYZ earns 18.18 % on its total assets. Suppose, company ABC & XYZ operates in the same industry. If we compare company ABC & company XYZ then company XYZ utilizes its assets more efficiently than the company ABC. As company XYZ has more earnings on assets than company ABC. As an investment analyst, it makes more sense to invest in a company which utilizes its assets efficiently. Return on Average Assets formula is an indicator which helps to access how profitable a company is, relative to its own total annual assets. Return on Average Assets gives an idea to an analyst, investors, managers as to how efficient management is at using its assets to improve earnings. Return on Average Assets generates the profitability of a business in relation with its total annual assets. Return on Average Assets is a type of Return on investments so it helps to indicates the performance of a company. Return on Average Assets shows how efficiently a management or a company can convert the money used to purchase total assets into profits or net income. It makes sense that a higher ratio is more favorable to the management and investors because it shows that the firm is more effectively operating its assets to produce greater amounts of net profit. For the management, return on Average Assets ratio is also important because the ratio can tell a lot about the performance of the firm; and by comparing the ratio with the similar companies under the one industry, management should be able to understand how well the firm is doing. 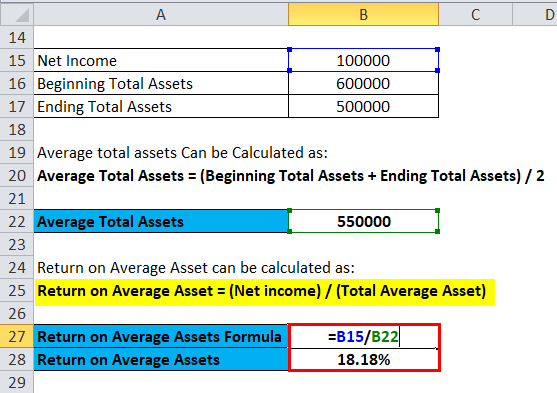 Here we will do the same example of the Return on Average Assets formula in Excel. It is very easy and simple. You need to provide the three inputs i.e Net Income and Total Average Asset. You can easily calculate the Return on Average Assets using Formula in the template provided. first, we calculate Average total assets.